We are delighted to invite you to IAM's 52nd Annual Meeting, October 7 - 10, 2014 at the Orlando World Center Marriott. Get ready for four days of networking, exhibiting, business, education and socializing in sunny Orlando, Florida. Hotel reservations are officially open, online or by phone, and we encourage to book early. See below to make your reservations for October 7 - 10, 2014! 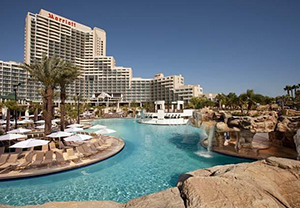 IAM has contracted directly with the Orlando World Center Marriott to offer the lowest group rate possible to our attendees. The only way to reserve a room at the discounted group rate is to do so directly with the hotel utilizing the methods outlined below. We urge you NOT to book hotel rooms through any other format or search engine(s) as IAM has not contracted with any third-party housing company to secure hotel rooms. RESERVATION BY PHONE: To make your hotel reservation by phone please call + 1- 407-239-4200 or + 1- 888-789-3090 and refer to either the group name IAM or International Association of Movers. GUARANTEED RESERVATIONS: All reservations must be accompanied by a first night room deposit that is guaranteed with a major credit card. The hotel will not hold any reservation unless it is secured by a credit card. HOTEL CUT-OFF DATE: Discounted room rates are available until Thursday, September 11, 2014. After this date, discounted rates and/or rooms will be based on availability by the hotel. HOTEL CANCELLATION: If room is cancelled less than 72 hours (3 days) prior to your arrival, a one-night room fee and tax(es) will be charged to your credit card. Setting Up Meetings? Choose an Official Meeting Point! At the IAM Annual Meeting, Governing Members receive the Early Bird Registration Rate for all company attendees regardless of registration date, PLUS a 10 percent discount on Regular Exhibit Fees. Contact Membership@IAMovers.org to find out more about upgrading your membership to Governing status and taking advantage of these - and other - benefits of membership.